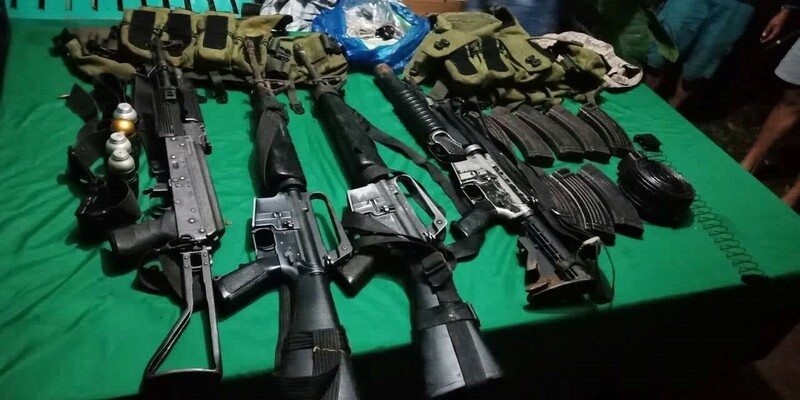 MALAGOS, Davao City - An arms cache of NPA rebels at Sitio Cabarisan, Brgy. Sibulan, Toril District, Davao City was seized by the troops of 3rd Infantry Battalion, on the evening of September 20, 2018. The firearms and ammunition recovered were: two (2) M16 rifles, one (1) AK47 rifle, one (1) M653 rifle with attached M203, M203 ammunition, magazines of AK47 with live ammunition, and two (2) bandoleers. These were brought to the Headquarters of 3IB for proper documentation and disposition. Meanwhile, Ltc. Oscar P. Partuza, the Commanding Officer of 3IB maintains their commitment and enjoins the people to be their partner in sustaining the peace and security in Davao City. “We are enjoining all our peace-loving Davaoeños to support all our efforts in putting a stop to the horrible acts of CNTs against our constituents. With our collective actions and continuous vigilance, we can totally rid Davao City of criminals and terrorists,” Ltc. Partuza said.